Broadway attracts visitors from around the world and our offices in Broadway, named for its broad High Street, is known as the gateway to the Cotswolds and is an excellent base from which to sell property in Gloucestershire, Worcestershire and Warwickshire. Charlie Comber and his team in Broadway are passionate about providing their clients with a high level of service and giving straightforward advice. 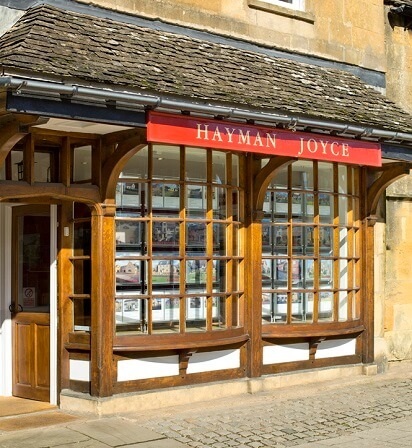 "Our business is a people business and our clients are generally recommended to us by people who have had a good experience when buying or selling through Hayman-Joyce." We are dedicated to offering the best possible marketing advice and give realistic advice about pricing, advertising and timescales. My team knows the area well and can advise on regional property trends, local schools, transport links and leisure pursuits in the area. We use a proactive sales approach and offer our properties to the local, regional and global markets with well thought out advertising campaigns and excellent website presence. Broadway is well known as one of the most lovely of the Cotswold centres, yet it also has the advantage of good shopping facilities including a small supermarket, chemist, post office, butcher, delicatessen, churches of many denominations, library and health centre. The larger cultural and shopping centres for the area are Cheltenham (approximately 15 miles) and Stratford-upon-Avon (approximately 15 miles). There is a mainline train station to London Paddington at Evesham (approximately 6 miles) and Moreton-in-Marsh (approximately 8 miles) scheduled time approximately 90 minutes.